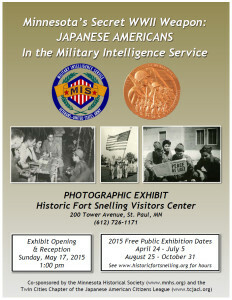 The Minnesota Historical Society, in co-sponsorship with the TC JACL Education Committee is pleased to announce an exhibition of photographs related to the role of the Nisei servicemen and women of the Military Intelligence Service during WWII. 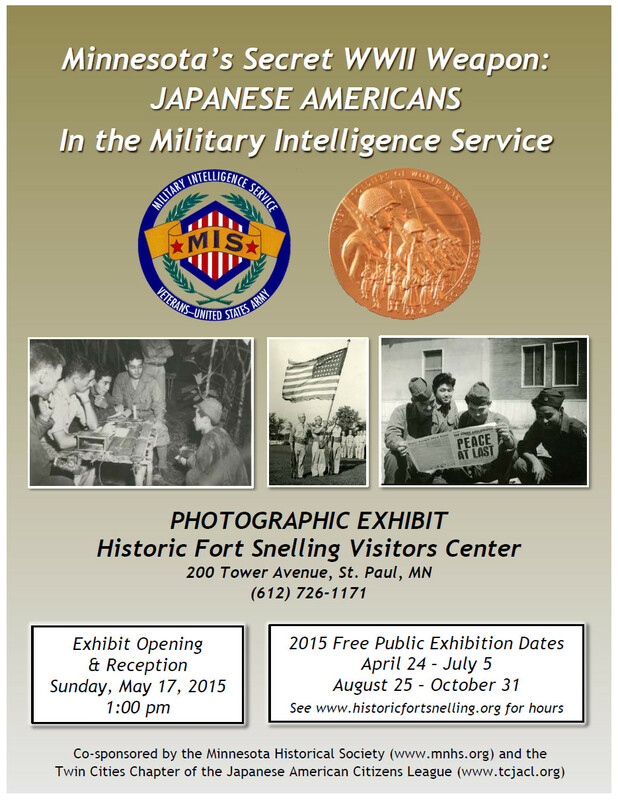 This exhibit, Minnesota’s Secret WWII Weapon: Japanese Americans in the Military Intelligence Service, is being shown for the first time in the Midwest, and will be held at the Historic Ft. Snelling Visitors Center, 200 Tower Avenue, St. Paul, MN. An opening dedication ceremony will be held on Sunday, May 17th, 1:00 p.m. The event is free of charge and open to the public. Mark your calendars now and plan to attend. 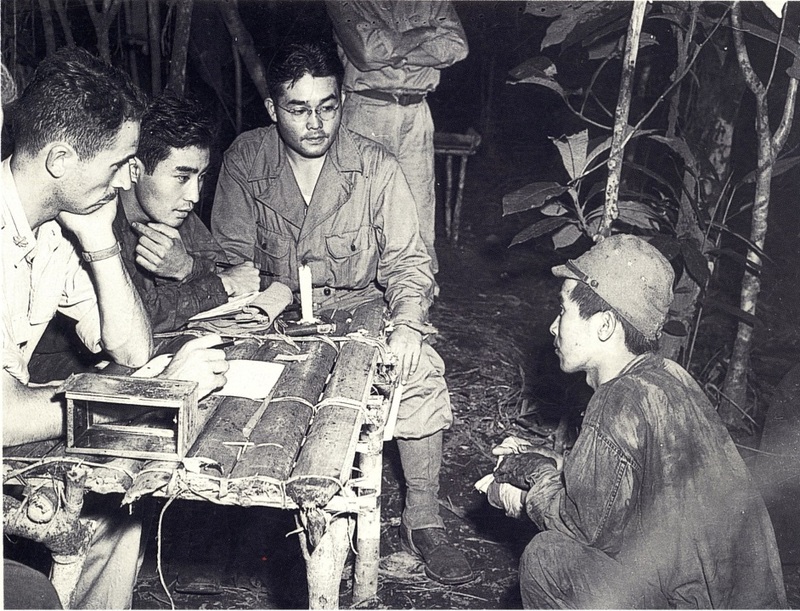 The Military Intelligence Service (MIS) has been called “America’s secret weapon in the war against Japan.” During WWII nearly 6000 Japanese American service men and women received intensive and accelerated training in the Japanese military language at the MIS Language School at Minnesota’s Camp Savage and Fort Snelling. Sent in small teams, these MIS soldiers participated in every major campaign in the Pacific. “Never in military history did an army know so much about the enemy prior to actual engagement,” said Gen. Douglas MacArthur. This vital intelligence operation saved lives and helped shorten the war by two years. Due to its highly classified nature, the role of the MIS was kept secret for many years. Now their story can be told through this exhibit and they can receive the recognition they deserve. The exhibit will be on view from April 24 – July 5, and again from August 25 – October 31st, 2015. Visitor Center hours are Tuesday – Saturday, 10:00 a.m. – 5:00 p.m. In conjunction with the exhibit, several educational programs are also being planned – a panel of former MIS soldiers, a documentary DVD, and a book signing. Dates and times are yet to be determined. We need your support for this exhibit! View our campaign letter. 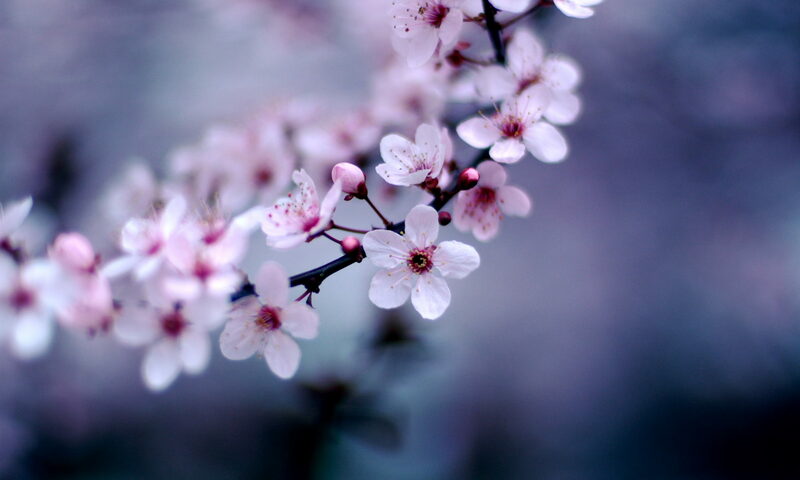 The mission of the Japanese American Citizens League is to secure and maintain the civil rights of Japanese Americans and all others victimized by injustice and bigotry. 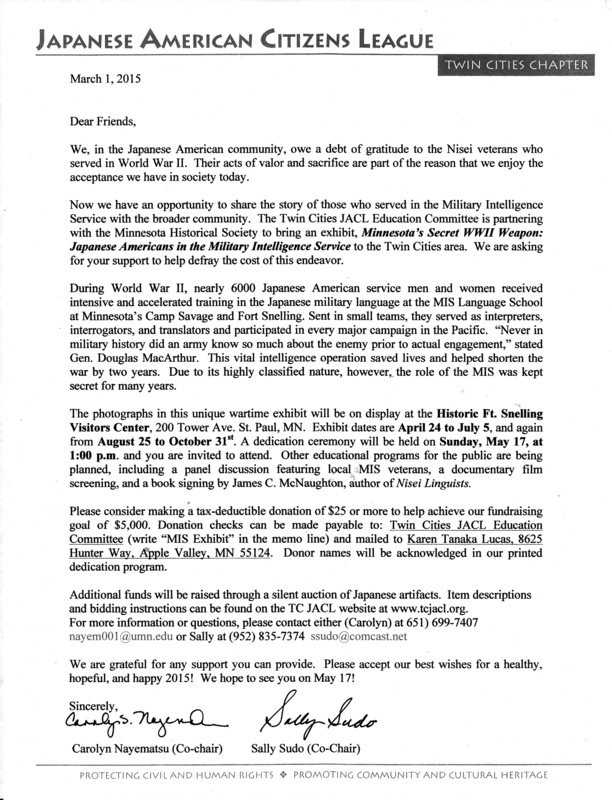 The leaders and members of the JACL also work to promote cultural, educational and social values, and preserve the heritage and legacy of the Japanese American community.